Submitted by Andrew on September 24, 2012 - 1:07am. I would hate having to pedal down the hill more than pedaling up it. Submitted by Rashkavar on September 24, 2012 - 11:07am. You pedal down hills? You're mad! Submitted by Son of Grean on May 27, 2014 - 1:08pm. We've a hill like that back home (except being in the country, it's a boreen with grass growing in the middle), the worst is definitely going down, because it goes into a road at the bottom with a ninety degree sharp corner to the left, so without breaking (both front and rear) all the way down the hill you'll be straight over the ditch and hitting your head on the stones at the bottom of the stream in the field just beyond. But to be honest that's nothing compared to coming down Christ the King hill over in Aherlow, Co. Tipperary which is about a mile of hairpins going down at 25-30 degree inclines. Scary, especially when drunk. Submitted by John H on September 24, 2012 - 3:32am. Submitted by hendertime on September 24, 2012 - 3:51am. Submitted by Shadowydreamer on September 24, 2012 - 3:46pm. Submitted by antisense on September 24, 2012 - 7:52pm. Submitted by JennaPeterson88 on September 25, 2012 - 2:52pm. That was my first thought too! My Mom has a scar above her right eye from an amusing childhood event involving her best friend's bike and that hill. Submitted by JohnnieCanuck on October 13, 2012 - 8:33pm. One day in January, I took my mom to visit her old school chum out in White Rock at the top of that street. There wasn't any snow in Richmond when I picked her up. I'd only been driving a couple of years at that point. By the time I could see how steep it was, it was already too late to get back up to the top. We went down with the right hand tires in the snow at the side of the road. Everything else was glistening hard pack. We made it ok. Submitted by AckAckAck on September 24, 2012 - 10:07pm. Oh yeah I remember my dad told me how people back in the 60s riding single gear bikes for kilometers/miles on unpaved/dirt road for work/school/any other activities. Those people are as tough as steel. Meanwhile hipsters can only ride their single gear bikes on a paved road. Submitted by Red on September 25, 2012 - 2:54pm. The first few Tour de France's were on fixies only. After 5 or 6 years, freewheels were allowed. After another several, a derailleur. Those badasses raced thousands of kilometers over the Alps and Pyranees. On an unrelated topic, I want a single-speed bike. Submitted by AckAckAck on September 26, 2012 - 1:44am. Oh man that's badass! Crossing Alps and Pyranees with fixies? I think Tour de France need to create a special class challenge for that. Also I want a single speed bike too. Screw hipsters, those bikes are built tough and not just for show. Especially the one made years ago. Submitted by freiheit on October 7, 2012 - 2:07pm. I believe they'd change the rear cog (maybe also front?) when they got to the start of a big climb. Big wingnuts instead of quick releases. But, still, fixies and no support! Had to carry their own spares (bandolier style), etc. Submitted by Dan Junor on September 26, 2012 - 10:19am. I have two major hills that I have to cross on my commute to and from school. I once had a homeless guy pass me on the hill. I almost cried. Submitted by ffejery on September 29, 2014 - 1:52pm. 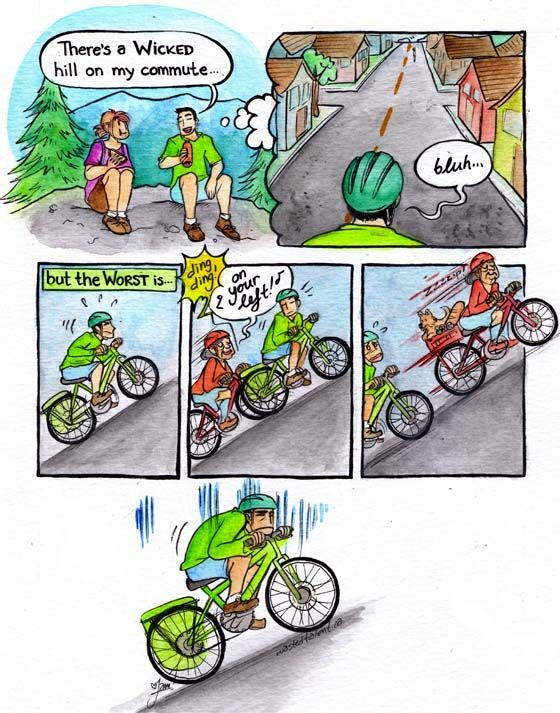 As a new cyclist, this has yet to happen to me, but I did pass a group of ~9 year-olds discussing their latest triathlon times, which had a similar effect on my morale. Make way for grannies on fixies, son! They been rocking that hill since before you got off your training wheels!